Earlier this year, I reviewed Logitech's Harmony Home Hub that, with its companion Smart remote, has seen daily use in my living room. Since then, I've been reviewing other Home Automation products and discovered I'm now collecting apps like I used to collect IR remotes to control my living room electronics. Having just reviewed the SmartThings Hub and several sensors, I was excited to read news that Logitech just released a new firmware update that adds smart home control to all Harmony Hub-compatible products. Support for SmartThings, along with peq hubs, Lutron Caseta lights and Serena window shades is baked into this latest firmware release. While the previous version had support for Nest thermostats, the new firmware also supports viewing Nest Protect smoke and CO alarm status, Honeywell Wi-Fi thermostats and IFTTT integration. For SmartThings integration, the Harmony support site confirms the firmware upgrade is compatible with Harmony Hub-based and Harmony Home Products. Harmony Living Home products are unable to control cameras, moisture/water sensors and smoke/CO sensors connected to SmartThings. The update is not compatible with IR controllers. In order to get SmartThings support, you must install the latest firmware. I checked my firmware before starting and found support only for Nest and Hue Home Automation. The firmware upgrade is fairly simple; from either mobile platform, select Menu, Harmony Setup and Upgrade Hub Software. After updating the firmware, it's quite simple to add SmartThings to your Harmony. SmartThings is treated just like any other device such as a TV, Receiver, etc. From the Menu, go to Harmony Setup > Add/Edit Devices & Activities > Select Devices and click on Add Device. Next, select Home Control and scroll down to SmartThings. You'll be prompted to sign into your SmartThings account and asked to authorize Harmony to access your Hub. You'll then select individual SmartThings devices for Harmony to control. While this might sound complicated, it's really not. I've included a short gallery below to show you the steps. 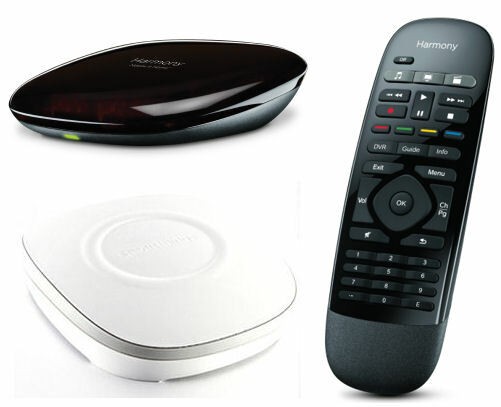 Once you add SmartThings to your Harmony Home system, Harmony will synchronize the new "device" with its servers. So when you launch the Hamrony app on other mobile clients, the SmartThings device will appear. However, I discovered that you will need to perform a refresh and re-login to SmartThings on each mobile device to authorize each installed SmartThings device. You only need to do it once per mobile device. If you don't, the devices will appear, but you won't be able to control them.